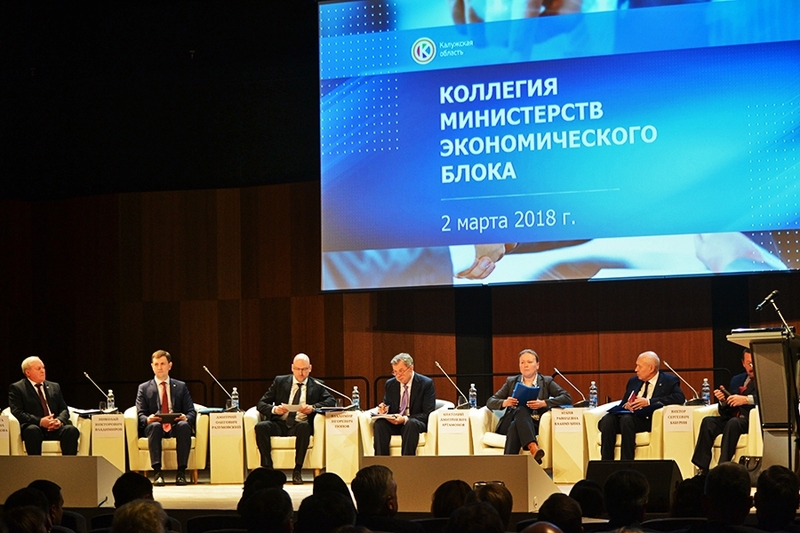 Joint enlarged session of collegiums of three Kaluga Region ministries took place on the 2nd of March: representatives of the Ministry for Economic Development, the Ministry of Finance and the Ministry of Competition Policy took part in the session. 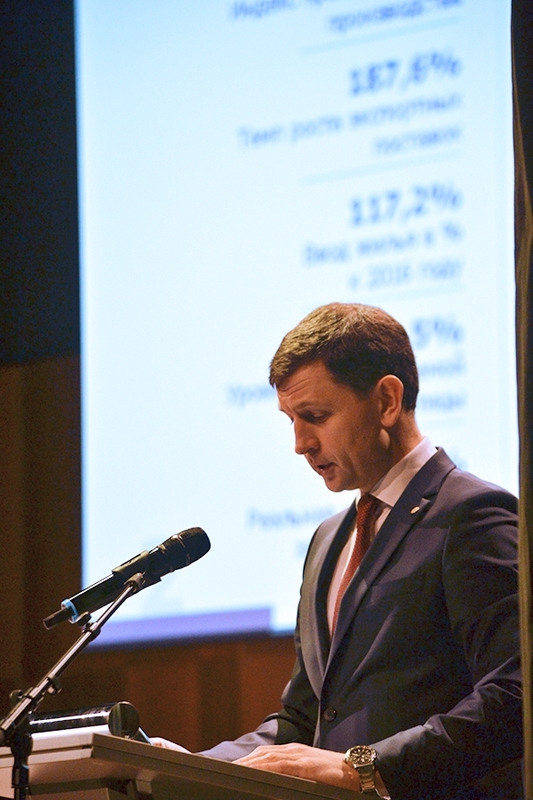 Dmitry Razumovsky, Minister of Economic Development of Kaluga Region addressed the meeting with activity report regarding socio-economic results of 2017 and plans for 2018. The key economic event of 2017 is the transition of the regional economy to the stage of sustainable development. Growth of real Gross Regional Product (GRP) has been registered for the second year in a row. According to experts, index of physical volume of the GRP in 2017 exceeds 104%. 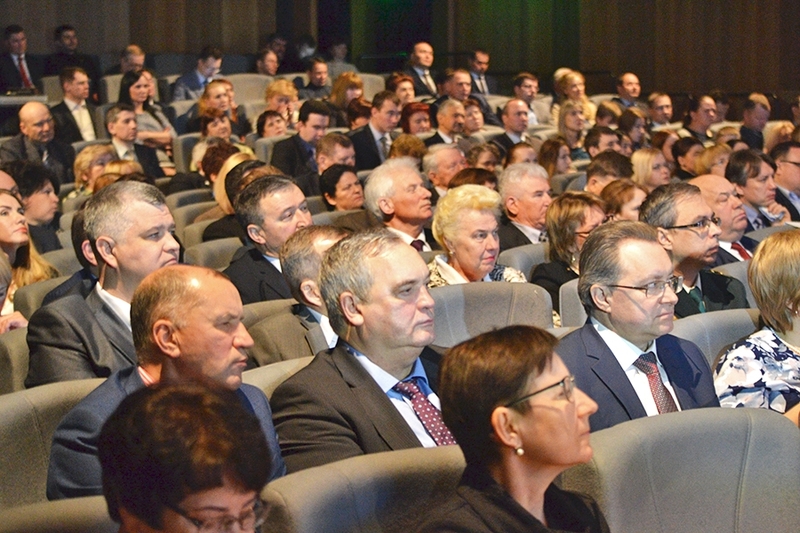 The model of development that Kaluga Region selected, based on diversification of economy and cluster policy, continues to prove its effectiveness. The positive dynamics of real Gross Regional Product is explained by the growth of production in real sector. Volume of industrial production was increased by more than 12%. Agricultural sector demonstrated growth of 10 percent. The growth of tax receipts amounted to 15.5%. Kaluga Region managed to keep its leading positions upon results of National Rating of Investment Climate Status in constituent entities of the Russian Federation. It is number 5 in the Rating. According to information of the Center for Studies of Regional Economy, Kaluga Region is the leader of the rating of Russian regions by volumes of shipped products per capita. It is the leader among constituent entities of the Russian Federation by the level of development of socio-economic conditions for innovative activities. As far as industrial growth is concerned, Kaluga Region is among the ten best regions of Russia. Volume of shipped industrial products over 2017 exceeded RUR 700 bln. Manufacturers of construction materials, metal products, car makers were the drivers of growth in industrial complex in 2017. Kaluga pharmaceutical cluster demonstrated the best development dynamics over the last years. High growth level of pharmaceutical production should be noted, the index of industrial production amounted to 167 % in 2017 году. Kaluga pharmaceutical cluster was the one and only in Russia to win Silver Label of European Secretariat for Cluster Analysis. Growth of export shipments is another achievement of 2017. Last year, volume of export of Kaluga enterprises exceeded figures of 2016 by more than 90%. Export to the countries outside the CIS grew by almost 2.5-fold. Today, Kaluga enterprises export their goods in 84 countries worldwide. According to data of Russian Export Center, Kaluga Region is ranked third in the rating of Russian regions by dynamics of its export. It is important that non-resource-based, non-energy export is developed first of all in the region. 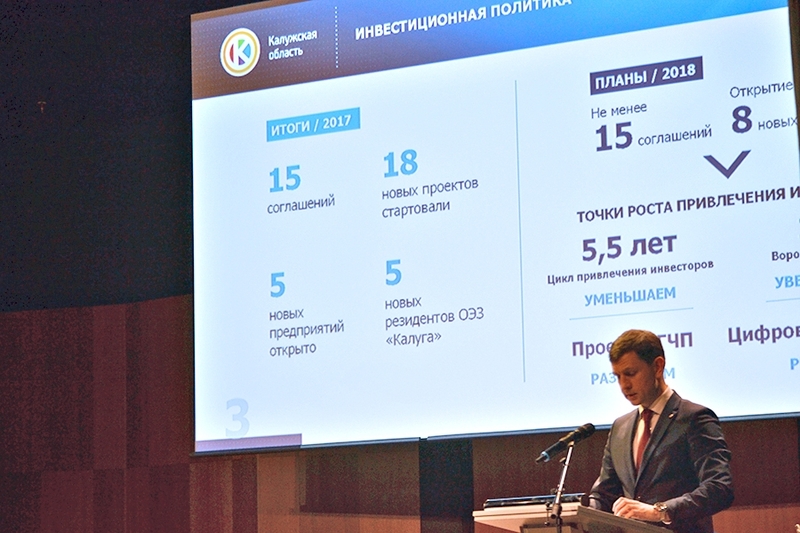 5 major industrial enterprises were opened in 2017, 15 new investment agreements were signed, 5 companies obtained the status of resident of Kaluga Special Economic Zone. There are some 200 contracts in the investment portfolio of the region; this being the basis for future investments. RUR 880 bln of investments have been attracted to the regional economy since 2006. Small and medium enterprises are more and more actively involved in international production chains. Maximum assistance is provided to them in this and in other issues. Small enterprises gradually reinforce its positions. Today, their share in regional GRP already amounts to 30%. Telling about support for industrial production, Dmitry Razumovsky noted that upon results of 2017; 11 companies performed modernization of their production facilities, 7 companies obtained guarantees and sureties from SME Corporation (RUR 813,000 of credit resources were attracted); special investment contract was concluded with one company; federal subsidies for production development were awarded to 3 companies; 1 company received loan of RUR 500 mln at the Fund of Industrial Development. “Work aimed to efficient development of territories will be continued in 2018. Priorities will include active interaction with federal development institutes, use of new regional support tools (regional investment support, special investment contract and modernization register), launching of program for Higher Productivity, promotion of cooperation”, - Dmitry Razumovsky summed up. New points of economic growth are determined for single-industry towns. So, Priority Social and Economic Development Area was created in Sosensky single-industry town by Russian Government Decree No 1370 dated 13.11.2017. The accent will be made on enhancing local human potential and creating highly-paid jobs. “Priority Social and Economic Development Area will be created in the future in Kondrovo town”, - Dmitry Razumovsky added. Enterprises of Kaluga Region get new opportunities for entering new markets. New Silk Road export projects will assist them in doing this. Scheduled container train was launched in 2017 from Chengdu (China) to Freight Village Vorsino in Kaluga Region. 25 export container trains have been already formed to China destination. First container train from Vorsino Industrial Park, Kaluga Region, arrived to Hanoi, capital of Vietnam in January 2018. Container with cosmetic products from Russian manufacturer was shipped as part of container train from the terminal of Freight Village Vorsino multi-modal transport and logistics complex. It should be noted that Kaluga Region became part of Mew Silk Road, international logistics project, consolidating economic interests of Russia, China, South Korea and Eastern Europe. Logistics corridor Kaluga-Dalian was created in 2016. The project allows substantially cutting the costs of cargo shipments and reducing twofold the time of cargo delivery. The train travels between Vorsino railway station (part of Freight Village Vorsino multi-modal complex) and Dalian port in China. In autumn 2016, first container train from Mumbai (India) arrived to Vorsino railway station.